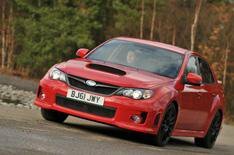 2013 Subaru WRX STI 340R review | What Car? With the demise of the Mitsubishi Evo, the Subaru WRX STI is the sole four-wheel-drive rally-bred performance car on sale today. Its got its own niche, then, and a recent price cut of 5000 (bringing the standard car down to 27,995) means its a more appealing prospect than ever. Here we're testing the 340R, which is the new range-topping version. It has more power and torque from its turbocharged 2.5-litre engine, while a new exhaust system promises a suitably throaty soundtrack. The 340R is available as a four-door saloon and a five-door hatchback, with both models costing 29,664. Whats the 2013 Subaru WRX STI 340R like to drive? Start the engine and youre greeted by a loud warble from the exhaust that suggests there's plenty of fun to be had. True, the low-speed ride is pretty unforgiving, but its rarely bad enough to make you wince. Performance is distinctly unremarkable until the turbo wakes up at about 3000rpm. However, keep the revs above this and its a savagely fast car. The sensational grip and body control also impress, letting the 340R hang on in bends, almost regardless of speed. It's just a pity the steering doesnt fill you with confidence; theres not enough feedback about how the tyres are faring, and some people will find it too light. The engine note is far more likely to win you over, because the 340R sounds like it's escaped from a rally stage when you drive it the way its maker intended. Just don't expect it to be relaxing on a long motorway drive; there's lots of wind and road noise at speed, and you can hear all sorts of road debris hitting the wheelarches. Whats the Subaru WRX STI 340R like inside? The WRX STI is based on the Impreza that was sold in the UK until summer 2012. Sadly, cabin plastics that were disappointing in a small family car look downright poor in a performance car that costs twice as much. Theres no sign of the high-quality materials you get in the cheaper Renault Megane Renaultsport, let alone the ones in the similarly priced BMW M135i. The buttons and switches feel low-rent, too, although Subarus reliability record is excellent, so you shouldnt have any worries about being stranded by the side of the road. Theres space for four adults in the 340R, even if six-footers will wish they had a bit more rear kneeroom, while rear access is better than it is in many hot hatch rivals. However, the boot is quite small and it has a sloping floor. Standard equipment includes climate control, Bluetooth, xenon headlights and grippy Alcantara-trimmed Recaro seats. The WRX STI 340R is a performance bargain, and few cars are faster across country. To get a similar amount of performance and the all-weather ability of four-wheel drive, youd need to spend an extra 10,000 on the soon-to-be-discontinued Audi RS3 Sportback. Youll pay a heavy price for this ground-covering ability, though. Fuel, tax and insurance bills will be big, as will the cost of tyres and brakes. You also have to put up with poor refinement and a drab interior. In short, the WRX STI feels like a car from a previous era. We understand why you might be tempted by it, but the BMW M135i and Renault Megane Renaultsport are better buys. They're just as thrilling as the Subaru on an empty country road and are much easier to live with the rest of the time.